We can’t get enough of David Byrne’s new album, “American Utopia.” It’s on constant replay on the home stereo (such as it is), in my car, and in my head. (Fitting, for a former Talking Head.) It’s a terrific album, filled with fun weirdness. It’s also provided a backdrop against which to note the evolution of what I’ll call David Byrne’s positioning. The David Byrne of the 1970s and 1980s, who evoked the jittery discontent of modern life through abstruse words and a highly neurotic sound, is long gone. The more recent David Byrne, heard here and on his collaboration with Brian Eno of 10 years ago, “Everything That Happens Will Happen Today,” is very direct in his concerns and somewhat homiletic. “Is this meant ironically? Is it a joke?” he asks in the liner notes re the title of the new album. “… These songs don’t describe an imaginary or possibly impossible place but rather attempt to depict the world we live in now. Many of us, I suspect, are not satisfied with that world — the world we have made for ourselves. We look around and ask ourselves — well, does it have to be like this? Is there another way?” Byrne was similarly earnest on that surprisingly upbeat disc with Eno, and has gone so far as to launch the blog “Reasons to be Cheerful,” which promulgates the good news from around the world about Economics, Education, Health, Culture and more. If you fear that, say, Climate Change is hopeless, you’ll want to turn here. I don’t think it’s just because he figures we can’t handle any more bad news. Somehow, David Byrne, who always seemed emotionally remote, has become a warm-hearted social activist. 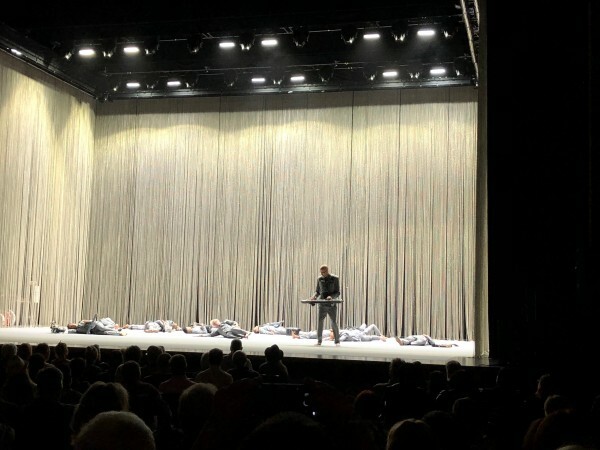 Three weeks ago, I took my wife to Las Vegas to see Byrne’s show, at the gorgeous Smith Center, where the acoustics proved to be remarkable and the performance even moreso. In addition to reinventing his music, Byrne has set out to reinvent the stage show that accompanies it. Note, below, the absence of an onstage set or, even, the normal components of a live concert: no drum kit, no cables, no amps, no keyboard stand, no guitar rack, no foot pedals, indeed, no nuthin’ except the musicians and whatever they can carry. This is very much a marching band. Rock concert? This didn’t seem like one. My wife said it was more like a combination of performance piece with music. Above, they set a mood for “Burning Down the House.” Below, note how the band, including the 65-year-old lead singer, plays dead while just the keyboardist carries on. And, here, how he opens the show, simply sitting alone onstage and singing about the workings of the human brain. That photo alone shows that Byrne is an interdisciplinary artist, not a rock musician. (As did this sensational and odd installation he put in the Pace Gallery in Menlo Park, which I went to see last year.) He’s a musician, yes, but also a visual artist, a film director, and a writer of non-fiction books, including “How Music Works.” His show is also tightly choreographed, and filled with joy — the joy of the music, and also the joy radiating from the performers who are delighted to present it. In that same week, my wife and I saw another interdisciplinary artist, Laurie Anderson. (Byrne on Wednesday night; Anderson on Friday night at the Wallis in Los Angeles.) Byrne has said he won’t be reuniting with Talking Heads because that would be an exercise in nostalgia and he’s not interested in that. 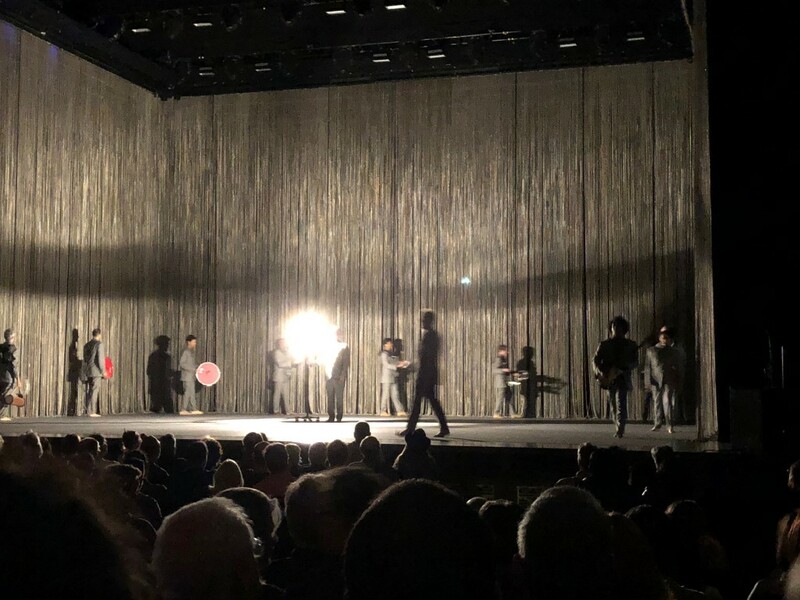 Laurie Anderson, meanwhile, is on what’s clearly a nostalgia tour: a clip show of her greatest hits, of sorts — video bits; some spoken word; talk about past events; very occasional electric violin. It was disappointing to see such a provocative artist reduced to just showing up and pulling bits out of a hat, and even more dispiriting to learn that, when unscripted, she can’t tell a good story. Byrne’s show featured eight songs from the (highly recommended) new album, eight Talking Heads songs, and six songs from his many collaborations over the years. If there are tickets left somewhere near you, you might want to get them. Maybe watching this recent appearance on “Colbert” will help convince you. Are advancements in technology primary aimed at improving the human condition — or eliminating human interaction? David Byrne lays out an interesting argument that it’s the latter. Byrne’s got a much longer list than this, which you can read here, along with his analysis of the situation. As for my own brief list above: I’m not missing my interactions with bank tellers; I alternate between buying books online or in person (at comics shops and book stores); I hate the automated telephone situation more than I can express; I still play board games with family (and card games), and also play on an xBox; and I make a point of having humans check out my groceries because it’s quicker than me at the self checkout and because I get to brag about how much I saved through coupons and also because I’m trying to help humans somewhere stay employed. Because, unlike machinery, humans need to eat. And here’s the low-budget puppet theatre version. All I can say after watching this is: I’ve worked with smaller budgets. Who doesn’t love that great Talking Heads song about babies, “Stay Up Late”? Especially when it’s played on accordion and tuba. I just found out about a great new music podcast, Sound Opinions, in which two very knowledgeable taste-makers bring a lot of insight to an hour-long discussion about music. Their range is wide and their taste is informed. On the most recent show, they discuss music with economist Paul Krugman, who notes that given the dire state of the world economy he needs music more than ever. Other discussions cover the music of Bob Dylan, R.E.M., Neil Young, and others. Here’s a link to the page about their recent show with Brian Eno. Eno, it should be noted, is not in the studio with them — they’re in the U.S., and he’s speaking with them from England — but these guys are so natural, so comfortable, that it sounds like they’re all sitting together talking over tea. In this particular interview, Eno is given just credit as an early pioneer of important musical trends (new wave; sampling; spoken word over music; ambient music; using the synthesizer as an instrument; and many more), and is asked smart questions about how he chooses collaborators (David Bowie; David Byrne with or without Talking Heads; Robert Fripp; Devo; Bryan Ferry with or without Roxy Music; as well as a couple of bands I don’t care about, such as U2 and Coldplay). The interview is played against the backdrop of music they discuss, from Eno’s vast repertoire, in such a way that every bit creates a new and better understanding of connections and influences across his 40-year career. (In the process, teaching me something new about “America is Waiting,” a song of his with David Byrne that I’ve been listening to with great appreciation for 30 years.) If you’re at all interested in music — and musical trends — of the past 40 years, I highly recommend this interview. 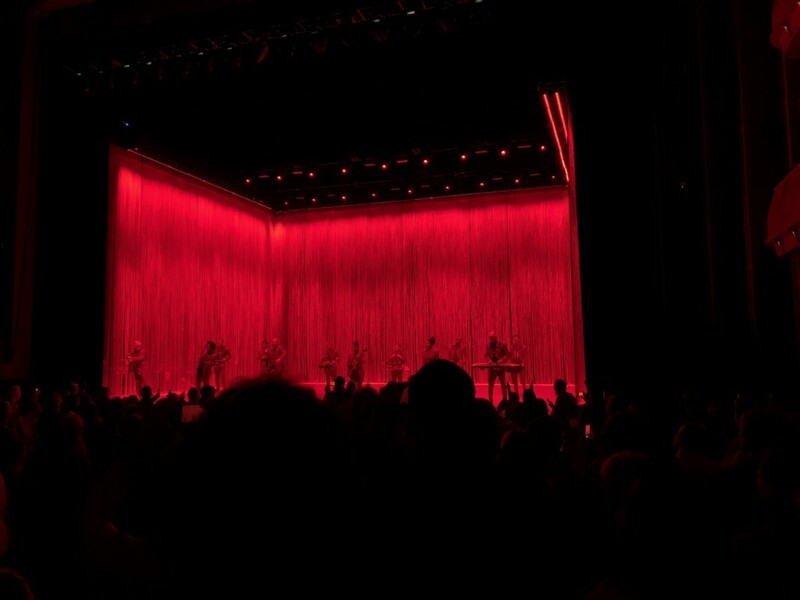 Thirteen years ago, David Byrne’s performance on the show Sessions at West 54th Street proved definitively how much he didn’t need the other people from Talking Heads. This video of “Making Flippy Floppy” serves as Exhibit A. The band is electrifying: I think the backup singer is terrific, in energy, look, enthusiasm, and vocal colors, and the keyboardist brings several good new textures to the song, but then, every member sounds great. 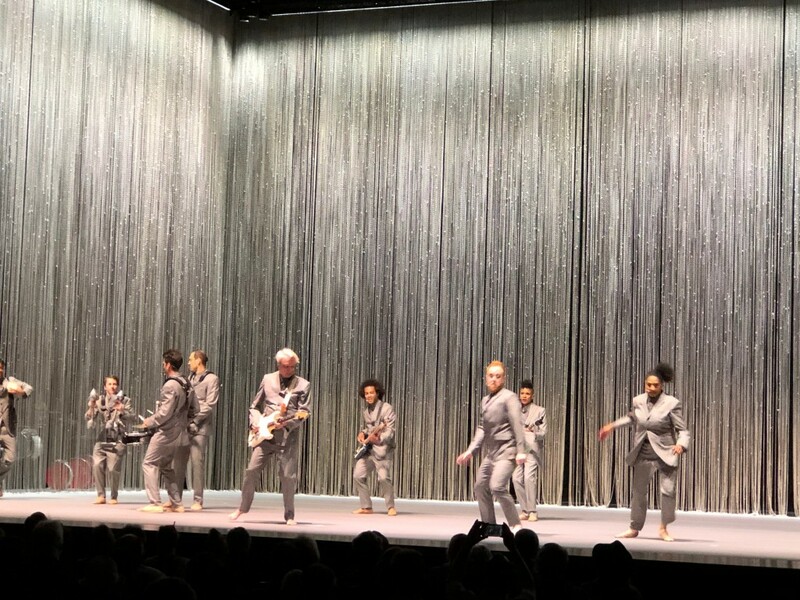 On a personal note, I have to say that David Byrne’s dance moves here speak directly to my soul. I encourage you to watch the entire video — including the final minute where he explains to host Chris Douridas his thinking behind the choice of those clothes. To this day, David Byrne is always thinking. In which David Byrne talks about his love for music, and his opinion that lyrics are overrated. As someone who has been listening to Byrne’s lyrics for more than 30 years, I agree with him that it’s often the sound of lyrics (his lyrics, anyway), that’s more important than the meaning. That’s because the songs he’s done both with and without Talking Heads have been largely connotational rather than denotional — they connote a certain mood or situation, most often: a rootless anxiety. (Or, sometimes, a quirky sort of hope.) This displacement from his surroundings puts him squarely in the tradition of postmodern artists where, of course, meaning is less important than immediate impact. Gertrude Stein and Virginia Woolf and William Burroughs and Donald Barthelme were usually more interested in transmitting a feeling than telling a story. And that sounds like a close approximation of what David Byrne does in his songs. Thanks to Paul Crist for alerting me to this video. 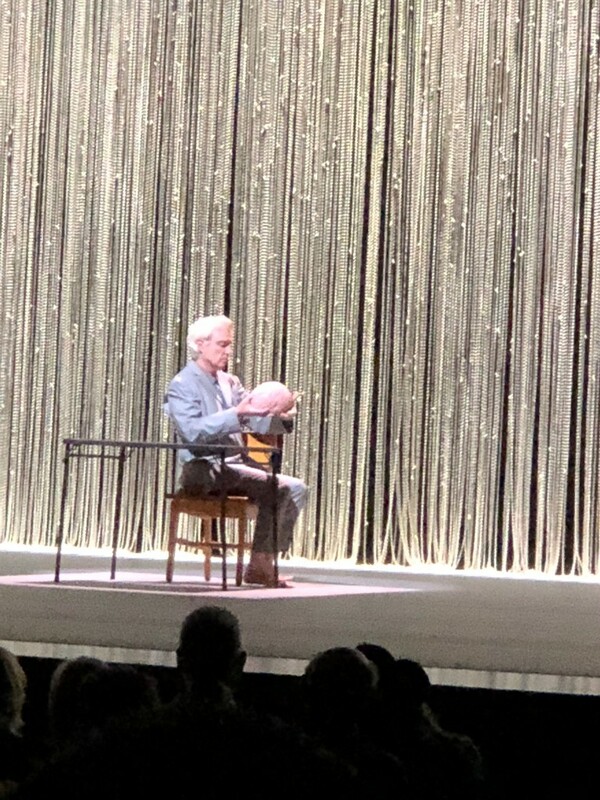 Or, more appropriately, more songs made by buildings, as David Byrne’s new musical experiment allows you to “play” the Roundhouse in London. Thanks to Paul Crist for making me aware of this. You are currently browsing the archives for the Byrne, David category.